Nelson Mandela's Party Faces Big Setback In South African Elections : The Two-Way The African National Congress has lost key races in municipal elections following a series of corruption scandals. It has governed South Africa since the country's first post-apartheid vote in 1994. 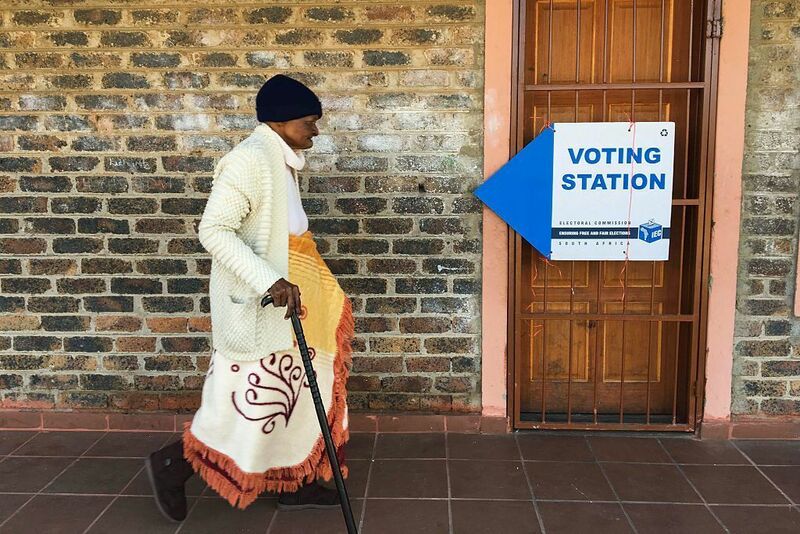 A woman makes her way to a voting station in Zithobeni during the 2016 local government elections on Wednesday in Gauteng, South Africa. The party of Nelson Mandela has lost key races in South Africa's municipal elections following a series of corruption scandals. It's the worst defeat in the history of the African National Congress, which has governed South Africa since the country's first post-apartheid vote in 1994. As reporter Peter Granitz told NPR's Newscast unit, the opposition Democratic Alliance gained control of the capital, Pretoria, and Nelson Mandela Bay, on the country's southern coast. Votes are still being counted in the economic center of Johannesburg, and Granitz reported the DA is claiming victory there, too. "[Zuma] is largely seen as mismanaging the economy amid a downturn. The unemployment rate here is about 25 percent. It's even higher for younger people, it's about 36 percent. So people are a little tired of him. And they're a little tired of the corruption scandals that have been nagging him since he came to power." That includes allegations that he used millions in public funds on upgrades to his personal residence, which he said were necessary for security reasons. As we reported, the Constitutional Court recently disagreed and said "the visitors' center, amphitheater, cattle kraal, chicken run and swimming pool at the Zuma residence, Nkandla, do not have a security rationale." As The Associated Press reported, the ANC "had never lost a major majority-black municipality" until this vote, and Zuma was so confident going into the race that he recently claimed the organization would rule "until Jesus comes back." "Election after election, the ANC has hung on to its past glory and kept its place in the hearts of most South Africans. It has relied on emotional appeals to its liberation history and traditional loyalties," South Africa's Mail & Guardian said in an editorial. "This time round, though, it's not enough." ANC deputy President Cyril Ramaphosa told reporters Friday that the organization would "do an introspective look at ourselves," The New York Times reported. "We are a party that's not going away from the body politic of this country," Ramaphosa said. "Where we have shown areas of weakness, we are going to get better and improve. That's who we are. We learn from our mistakes." The DA, once anti-apartheid parties run by white politicians, now has many black leaders and campaigned on a platform of good governance, the AP reported. "For far too long, the ANC has governed South Africa with absolute impunity," DA leader Mmusi Maimane said Saturday, the wire service reported. He added that "the idea that his party was a white one has been 'completely shattered.'" The political shift in this municipal election could have major ramifications for the 2019 presidential vote — and the DA is already beginning to look ahead. As the AP reported, Maimane said "the 2019 campaign starts now."